Here at WordPress.com you and your visitors can use your Facebook, Google+, Twitter or WordPress.com account to leave comments. 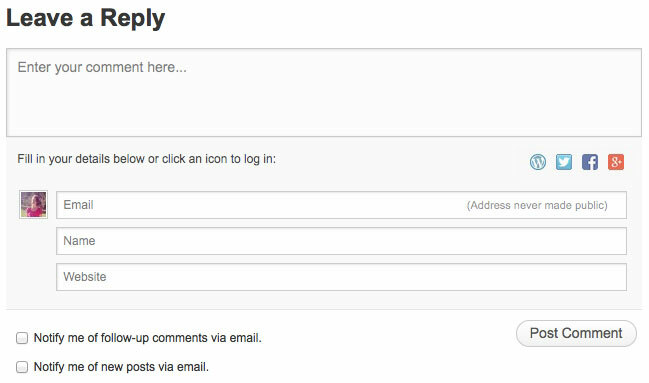 This unified comment form including Facebook, Google+, and Twitter login is active on all WordPress.com blogs. Note: The Google+ button only works on sites with a .wordpress.com URL. It won’t work on sites with a custom domain. The default comment login for visitors in the comment form is their WordPress.com account. To enable social media logins, click anywhere in the comment form on a post, then click on “Change” (next to the “Log Out” prompt). This will open the comment form in full and allow readers to reply using their social media accounts. When your readers click on the icon for Facebook, Google+, or Twitter, a new window will appear from that service asking them to log in and approve giving their information to your blog. This window is controlled by Facebook, Google+, or Twitter for security reasons. It is possible to be logged in to different services at the same time, in which case visitors to your blog will be able to choose which identity to use when posting a comment by simply clicking the appropriate icon in the comment area. They can also choose to leave a comment as a guest if they wish (unless your settings prevent that). The comments area will detect the theme you are using and switch between a light or dark version automatically to better blend in.